Some call her “the arts and crafts lady.” Easy to spot as she wheels her art cart around the Cross Cancer Institute (CCI), it’s a title Marie Butler says she’s privileged to wear, offering patients dealing with cancer treatment a respite from persistent thoughts of their disease. Over the past two years, the expressive arts therapist has split her time between the Cross Cancer Institute and the Westmount Shopping Centre site of the AHS Department of Psychosocial and Spiritual Resources, a place where cancer patients and their families are offered a bridge to well-being of mind, body and spirit. “We weave with intent – warp and weft, up, down and across – and when a thread breaks, it simply becomes part of the tapestry,” says expressive arts therapist Marie Butler. Meant to offer stress relief and a sense of joy, vitality and purpose to patients and families at various stages of the cancer journey, the AIM (Arts in Medicine) team has created popular classes in music (drumming and harp), painting, photography, journal writing and fibre arts that are part art class and part support group. While she guides much of the AIM programming, Butler is quick to say it’s entirely a team effort, led by director and clinical psychologist Dr. Shawn Steggles, registered psychologist Dr. Jill Turner and secretary Helene Sommer. Butler works with patients of all ages and their families. That sometimes includes a grief counselling program with kids who have a sick or dying parent, called Art for the Heart. At the Cross Cancer Institute, Butler uses her warmth, humour and musical ability (she’s played piano since she was six), to offer comfort to those in treatment. The role calls for containment in this circumstance, she says, rather than her preferred “make art, make a mess” philosophy. “Sometimes people are so sick, it’s a lot to ask of them to do art. Sometimes all I can offer is to play music on the piano. It’s a very personal thing for me,” she adds. Fellow AIM team member Turner says that at a time when cancer has sent their lives out of control, art can be a surprising and successful therapeutic tool for patients, providing a sense of creativity and a new positive that isn’t associated with unhappy memories or experiences. Patient satisfaction surveys give AIM programs top marks among all areas of psychosocial oncology. In his six years with AIM, Steggles says the number of groups have more than tripled, helping 465 people in the last year alone. And while demand is high, he says AIM’s mandate means all new patients who want to take part in one of the free classes can do so. “It wasn’t easy to put my life back together and move on, but weaving has taught me lessons: there are no mistakes, everything and everyone is unique, and sometimes you do your best work in your darkest times,” says breast cancer survivor Jennifer Jordan. In a serendipitous turn, Butler even took a weaving class of her own that has now become a symbol for AIM. Described by class participants as meditative, relaxing and life-changing, the eight-week freestyle weaving class uses a Japanese Saori loom. “There’s a nurturing aspect to the lull and rhythm of the loom, the different yarns, fabrics and textures. “But there’s also the camaraderie of being among fellow cancer survivors, working in a circle – talking or not – that creates a mothering energy. We weave with intent – warp and weft, up, down and across – and when a thread breaks, it simply becomes part of the tapestry. There’s mindfulness and spirituality that emerges with the work, and it reflects the participant’s own cancer journey,” Butler says. Breast cancer survivor Kristi Sainchuk, 39, calls weaving a metaphor for life and the first thing since her diagnosis two years ago that has made her happy. “I wanted to find a space in my head to be meditative. I can’t do yoga because I tend to ruminate and get anxious, but weaving forces me to focus,” says Sainchuk, who has since bought her own Saori loom to continue her weaving at home. 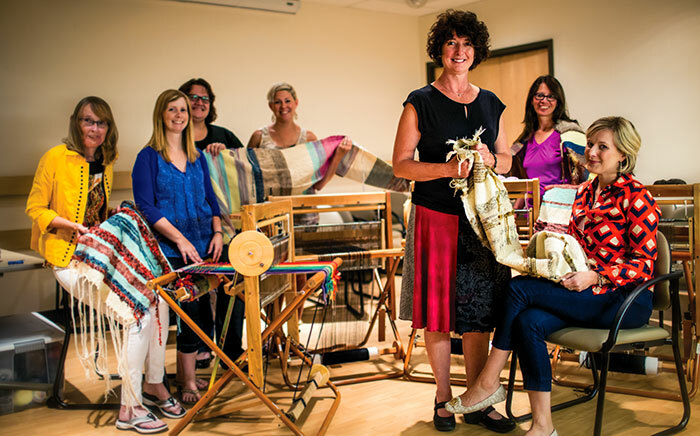 Funded largely by the Alberta Cancer Foundation at a cost of about $1,600 per loom, the initial weaving class pilot project brought together Butler, cancer survivors and a facilitator around several Saori looms for a weekly session. But a positive response led to a spring class and a weaving group that has since taken on a life of its own. Once a week through the summer, Butler and facilitator Tanya Corbin kept the weaving and sharing going, while the classmates created framed tapestries, prayer flags and even woven cards for a fundraiser – as a way to give back for the gift they say they’ve been given. That sentiment is echoed by Crystal Ewaschuk. Following a year that included being diagnosed with rectal cancer and having a subsequent heart attack, the need to relieve anxiety and stress brought the 52 year-old to AIM’s weaving class, where she found compassion and understanding. “Some days we talk more than weave. I was withdrawn, anxious and depressed, but the weaving has given me some pleasure in life. I don’t know what I would’ve done without this. Life has some meaning again,” she says. “It wasn’t easy to put my life back together and move on, but weaving has taught me lessons: there are no mistakes, everything and everyone is unique, and sometimes you do your best work in your darkest times,” adds breast cancer survivor Jennifer Jordan.